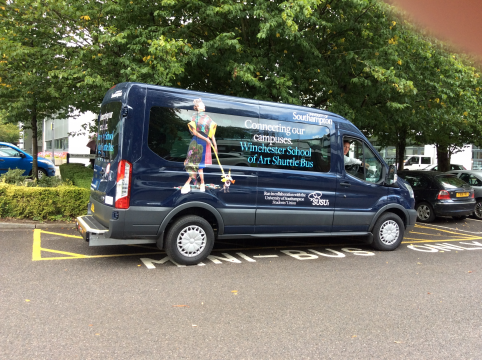 We have already promised that life at the Union will be bigger and better this year and the good news starts here: we have been working in partnership with the University of Southampton to launch a FREE shuttle bus to take students from Winchester School of Art (WSA) to Highfield Interchange. The bus, launching at Freshers’, is intended to make Highfield campus more accessible to WSA students. A Blue Ford Transit Van will provide the service, operating on weekdays on a 2 hour loop starting with departures at WSA (by the carpark next to Student Services) at 8:00am, with last pick-up at 11pm at Highfield Interchange. The vehicle can carry up to 15 students and includes full disabled access. The service is completely free, but students will need their student ID cards to board.